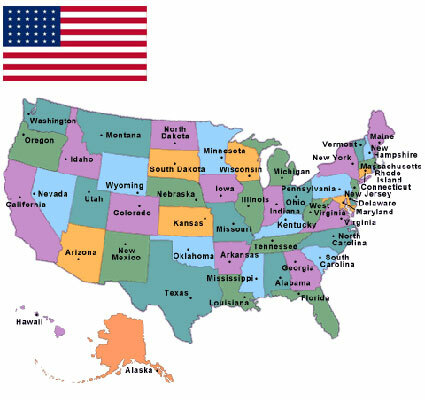 The United States of America (commonly called the United States, the U.S., the USA, America, and the States) is a federal constitutional republic consisting of fifty states and a federal district. Climate: The United States includes a wide variety of climate types due to its large size, range of geographic features, and non-contiguous arrangement. In the contiguous United States to the east of the 100th meridian, the climate ranges from humid continental in the north to humid subtropical in the south. The southern tip of Florida is tropical. The Great Plains west of the 100th meridian are semi-arid. Much of the Rocky Mountains, the Sierra Nevada, and the Cascade Range are alpine. The climate is arid in the Great Basin, desert in the Southwest, Mediterranean in coastal California, and oceanic in coastal Oregon and Washington. The state of Alaska—on the northwestern corner of the North American continent—is largely subarctic, with an oceanic climate in its southern edge and a polar climate in the north. The archipelago state of Hawaii, in the middle of the Pacific Ocean, is tropical. Literacy: The literacy rates stands at 99% for both males and females. Environmental- Current Issues: Climate Change, conservation, pollution, invasive species, nuclear, waste etc. Sub- Saharan Africa and Asia. International Airports: There are as many as 20341 airports in USA, out of these 5221 are for public use. Only 565 are certified airports. Ports of Entry: There are 149 ranked ports and various other unranked airports in USA. Major ports in USA include LOS Angeles, Detroit, New York & New Jersey, Laredo and Houston. You won’t need to register your business at the state level, if you set up your business as a sole proprietorship (also known as sole trader – a business entity owned and run by one individual). For many states, it is necessary that sole proprietors use their own name for the company / business name unless they formally register another name. This is referred to as your Doing Business As (DBA) name, trade name or a fictitious name. Your first choice of a business type is not permanent. You can initially register as a sole proprietorship, and if your business expands and your personal liability risk goes up, you can change your business to an LLC. "Doing Business As," "DBA," "Assumed Name," and "Fictitious Name" are references that are used when describing the procedure of registering a legal name for your business. The legal name of a firm / business by default is the name of the person or organization that owns a business. The legal name will be your full name, if you are the exclusive proprietor of your firm / business. However, if your business is a partnership, the legal name is the name outlined in your partnership agreement / the last names of the partners. The business’ legal name is the one that was registered with the state government, for limited liability corporations (LLCs) and corporations. Your business' legal name is a prerequisite on all government documents. Forms include your application form for employer tax identifications, licenses and permits. If you decide to set up a shop or sell your products under a separate name, then you might need to file an “assumed name” registration form with your state and local government. Your legal business name is needed on all government documents, such as your application for employer tax IDs, licenses and permits. You may have to file a "fictitious name" on registration forms with your government agency, if you wish to set up a shop or sell your products under a different name. An assumed name (or fictitious name, trade name or DBA (doing business as) name is a business name that is not the same as your personal name, the names of your partners or the formally registered name of your LLC or company. For example, if Tom Johnson the sole owner of a catering company he runs from his home, and he wants to change his business name to Seaside Catering instead of using his business’ legal name, which is Tom Johnson. Tom will need to register the new name as a fictitious business name (DBA ) with a government agency, in order to start using that name. The relevant government agency to register with depends on where she lives. You have to register fictitious names with the relevant state government or with the county clerk’s office in some states, but there are also some states that you do not have to register the fictitious business names. An Employer Identification Number (EIN) / Federal Tax Identification Number is needed to distinguish a business entity. Companies / businesses normally need an EIN. There are a number of ways in which you can put through an application for an EIN, including applying online. This service is free. It is offered by the Internal Revenue Service. You are required to check with your state to see if you need a state number / charter. In addition, you are required to obtain Tax IDs and permits from your state’s revenue agency, just as you are required to have a Federal Tax ID. If you decide to sell products and you need to compile sales taxes, you will probably be required to acquire a Sales Tax Permit or Vendor’s License. This can be obtained from your state or local government (or both). In the majority of states, business / company owners need to register their business with a state tax agency and apply for the relevant tax permits. It is a requirement in most states require for businesses to apply for a state sales tax permit, in order to collect sales tax from customers. Almost all states place a levy on business or corporate income tax. Your tax obligation is dependent on the legal configuration of your business. The LLC gets taxed independently from the owners, if your business is a Limited Liability Company (LLC), while sole owners report their personal & business income taxes using the same form. For specific requirements, contact the General Tax Information link under your state. Business owners with employees are also accountable for paying the appropriate taxes required by the state, as well as federal employment taxes. Payment of state workers’ compensation insurance and unemployment insurance taxes is required by all states. The majority of businesses need to acquire some category of business license or permit to formally operate. Most small businesses are required to acquire a general business license / industry-specific operating permits from state and local government agencies. You may be required to be licensed at the federal, state and/or local level, depending on your business. As well as a basic operating license, you might need specific permits, including an environmental permit. It's vitally important to understand the licensing rules where your business is based, as regulations change by industry, state and locality. Not adhering to the regulations for licensing and permitting can result in costly fines, as well as placing your business / company at serious risk. You might be required to acquire a federal license, if your business is taking part in activities that are supervised and controlled by a federal agency. Virtual office facility (Space for meetings, Fax, Internet, reception, file storage etc.) in various cities of USA.